To kick off the new year, we revealed the most visible publishers in Google’s news-related ranking types using the News Dashboard for the holiday season, in other words Thanksgiving 2018 through the new year (Nov. 23, 2o18 – Jan. 2, 2019). Below, we examined the top 10 most visible publishers, as well as some of their top keywords. The News Dashboard is an analytics and SEO tool that looks specifically at Google search visibility. All of the Google News categories – US, World, Local, Business, Technology, Entertainment, Sports, Science, and Health – are considered in this analysis. First, we took a look at visibility for Google News, or news.google.com. The traditional leaders of the second half of 2018 – YouTube and CNN – maintained the top 2 positions here. 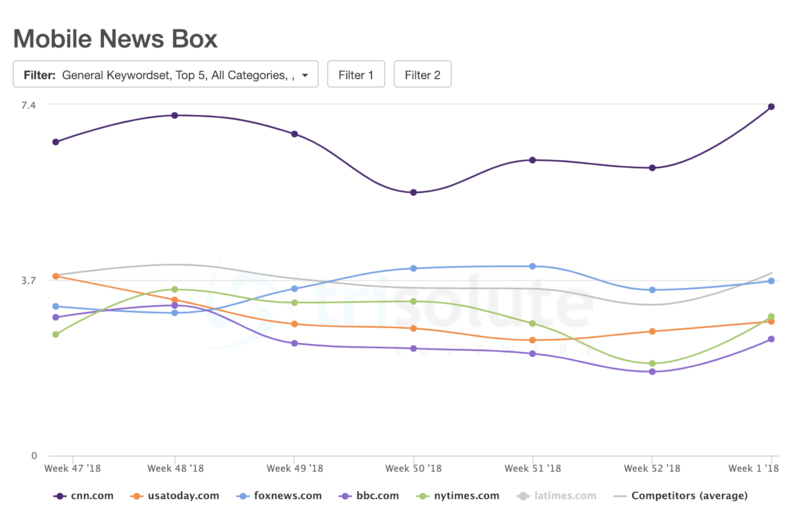 Fox News, USA Today, and the New York Times round out the Top 5 for this 7-week period. YouTube, CNN, and Fox News ended 2018 as the Top 3 most visible publishers in Google News. YouTube had a visibility score of 5.79 percent; CNN’s visibility score was 3.86 percent, and Fox News came in with 4.18 percent. All three of these publishers have managed to stay well above their competitors’ average visibility scores during this period. CNN’s highest visibility score for this news-related ranking came from Week 48 (Nov. 26-Dec. 2, 2018). The Top 5 publishers are ranked in the Mobile News Box for this week, along with the specific keyword they were most visible for. Next, we looked at Mobile Publisher Carousels. Week 49 (Dec. 3-9, 2018) shows that CNN is again the most visible publisher during this time period. It had the highest visibility score, which is 8.87 percent, and much higher than its score in the Mobile News Box. 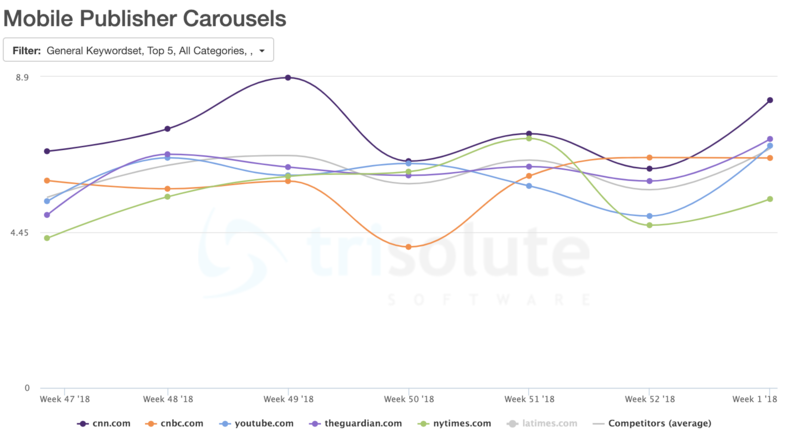 During this same week, the Guardian, YouTube, the New York Times and CNBC ranked as Top 5 Publishers in the Mobile Publisher Carousels. Below are the Top 5 Publishers and their most relevant keywords with the highest visibility in this period. It’s no longer a surprise that CNN ranks as one of the most visible publishers. The top keywords during the holiday season surprisingly had little to do with the holidays and everything to do with politics. If you are interested in finding out more about the News Dashboard, fill out the demo sign-up form on our website.